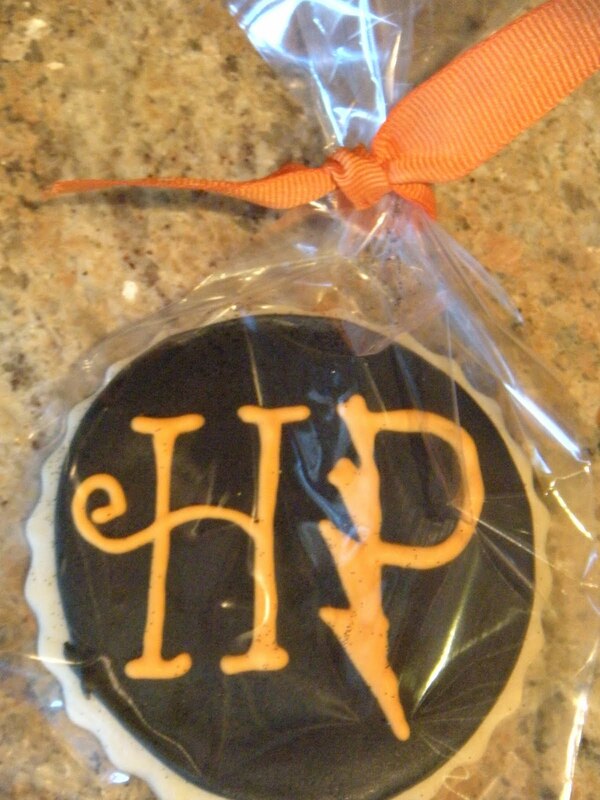 When I get a cookie order, I generally bake a few extra in case I have a failure, yes, it does happen. 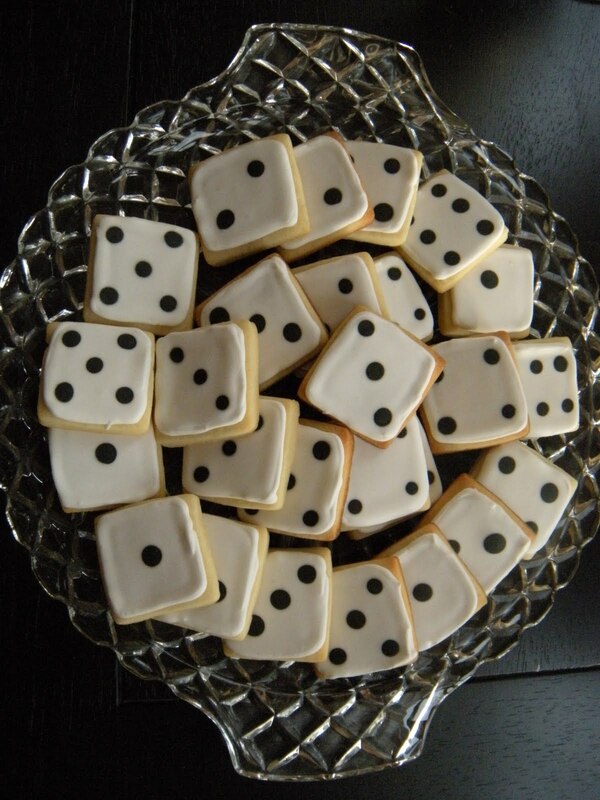 Sometimes though, things work out beautifully and someone who ordered a dozen may end up with a Baker's dozen. I did an order this week in an African theme for a dinner a friend was having with friends who all went on a mission trip to Kenya. The zebra stripe cookies were a bit of a challenge, and many thanks to SweetSugarBelle who posted a tutorial that was an enormous help! Of course when you peruse her site, my stuff looks a little remedial. But I am working on it! One of my Africa cookies was flooded with icing that was a little thick, and it was not a nice companion to the others, so I put it aside and sent it in Christina's lunch. She, being the friend she is gave it to one of her friends that is apparently obsessed with my cookies. She wanted to know why Africa? And what country was the heart? 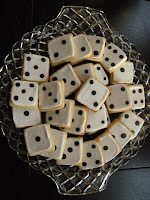 Christina explained, and her friend's response was "Every Cookie Tells a Story". She is so right. Even a lingerie shower! And of course there are dozens of holidays, thank you cookies for friends, showers, sporting events and beach themes. Yes, we all know I LOVE to bake for people. It is a creative, cathartic process. And I enjoy the whole concept of gifting. Sometimes a little sugar brings pure joy to someone, I like that I can be responsible for that. So of course I gave away plenty of sweets this past holiday, but I had a few gifts looming in the sewing room. And finally, I have finished! Since I am a pretty talented sewer I decided to put this here as well as the Hipline blog. 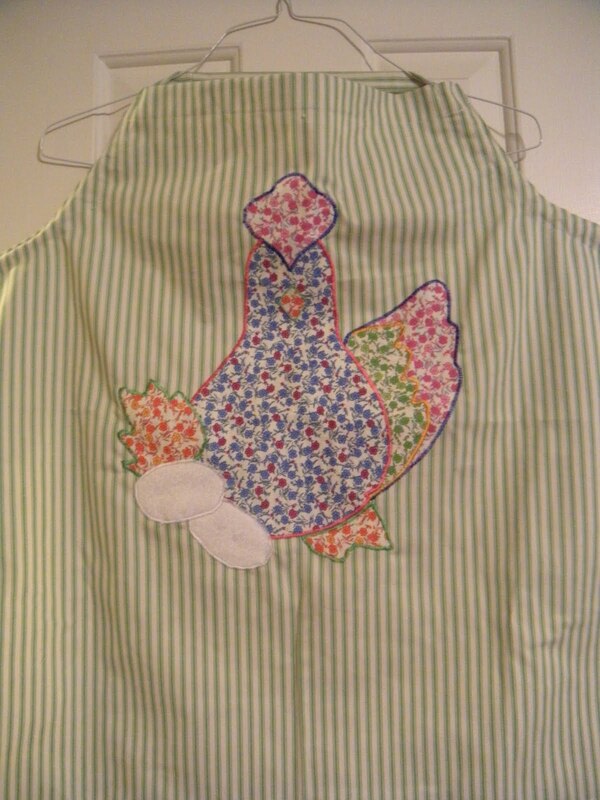 First up is the Chicken Apron. 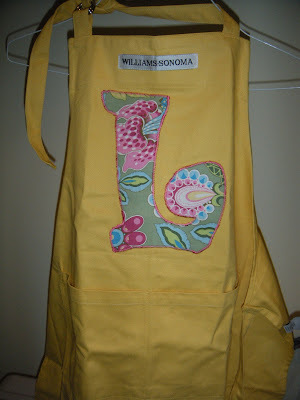 My frind Mel gets an apron a year from me. 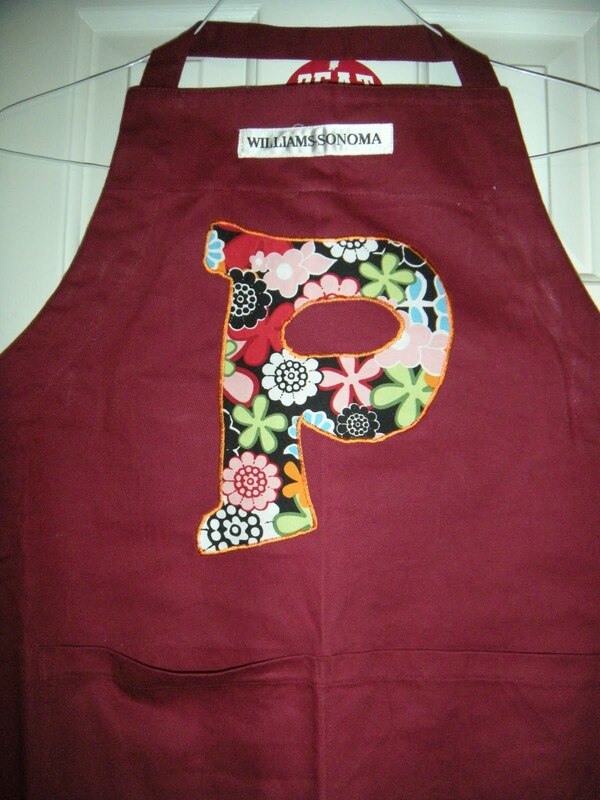 I am always looking for an idea to embellish a great canvas apron (wonder where I buy those?) I have monogrammed, embellished, left blank and even embroidered some clever saying. She loves an apron and especially likes the full ones that go over the head. I am a butcher apron girl, but more on that later. 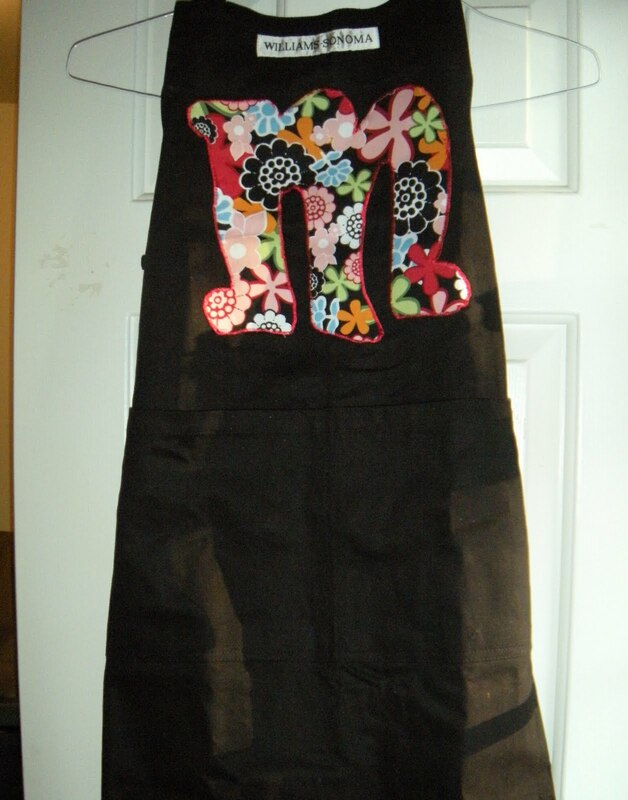 I gave her an appliqued apron like the ones that follow, for her birthday in October. 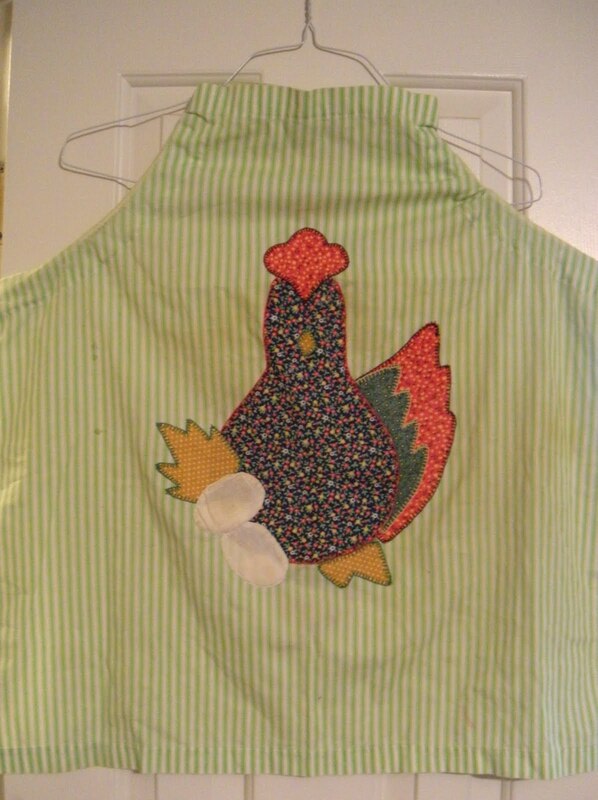 But when I was at her house gifting her, she showed me the apron a family friend made for her when she graduated from high school...in 1975. You do the math. The photo follows. 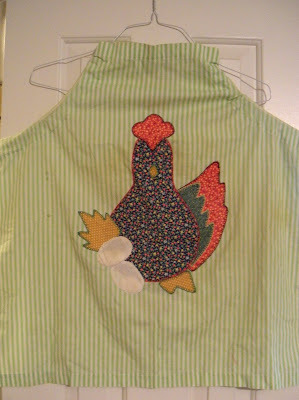 It is green ticking with a calico chicken whip stitched on the front. It is stained and well worn, and obviously her favorite. So I asked to borrow it. Yes, I know it is January and I have held her favorite apron for almost 3 months, but I think she may feel it was worth it. How cute is this? I found green ticking with no problem. 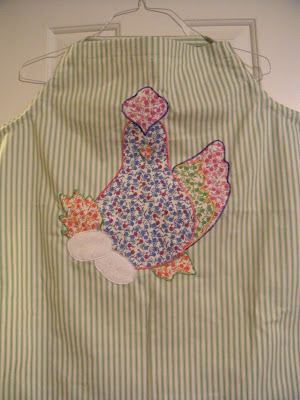 Then I spent hours (honest) trying to find coordinating calico-type fabric for the chicken. I think I got some updated colors, instead of whip stitching I appliqued, and well, the result is pretty darn cute. She's off playing in Vegas this week, but she will be gifted this weekend. My other apron gifts were for friends and family. I admit I get into a groove and stick with it. The groove now is applique. 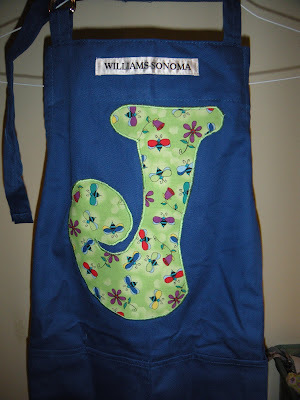 Big loopy letters in great fabric, way more fun than a boring old monogram. Take a peek. Back in the fall I did an article for Family Corner appliquéing beach towels, I just can't stop! I have been hitting the clearance shelves with the fleece throws in lots of colors to applique for the hundreds (okay maybe just 30) graduation gifts. Finally, I just couldn't resist an apron for me. But my needs are quite different. 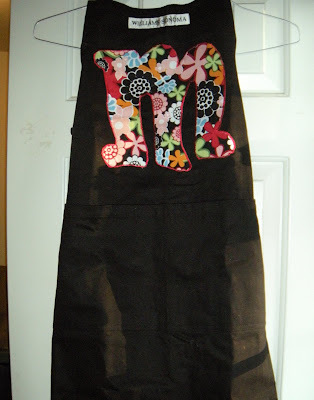 I wear the classic apron at work, so I am not interested in wearing it at home. I love a long apron with long straps and a straight cut. A butcher's apron if you will. I can whip one up pretty quick in a fun cotton for whatever mood or holiday stirs me. They don't really hang well, so you'll have to trust me on the finished product. Better yet, come on over when the ovens are fired up, I am certain to have one on. So, get in there and bake! Just over a year ago I blogged French Macaroons and they were okay. I dream of eating a beautiful pink one in a French cafe overlooking the Eiffel Tower one day, I feel most certain I would love them. Then one day before Christmas I was helping a friend bag cookies for a bake sale, and she reported back that her Coconut Macaroons were the first to go. So after a little hunting, I found a recipe that combines the airiness of a French Macaroon and the coconut of a traditional, denser macaroon, and these cookies are the product of that little marriage. The book is called the art of the cookie by Shelly Kaldunski, and it was a Christmas present. It wasn't the baking book I originally had my eye on, but like the hundreds of cookbooks I own, I curled up with it like a good novel and knew I would take away something wonderful. She calls them Chocolate Dipped Coconut Clouds, I call them delicious! Here's how it went down in my kitchen. My first batch of egg whites had been compromised somehow...I could not get them to peak. The power went out at that time, so it was just one more hassle. Power restored and a fresh batch started. Now, I have the largest Kitchen Aid stand mixer you can buy for your house. It took much longer than her reported 3-4 minutes to get stiff peaks, even in this super low humidity (unusual for Memphis even in the winter). And I added vanilla paste vs. the extract. It leaves little vanilla bean flecks in the batter. And that batter...if you have read other posts, you know I have an unhealthy obsession with meringues, actually just the whipped whites and sugar. I can say no to a baked meringue, but I can lick a bowl clean of raw, whipped egg whites. Yes, I know all about the terrible illnesses it could harbor. I am not scared. I folded in the coconut and made my little clouds. I licked the beater, the spatula and well, you get the picture. It was mighty tasty! I baked in convection at 320°, and rotated in the middle of the time. They did seem to spread a little more than I thought they would, next time I will build them tall and narrow. And sadly, because I am an incessant multi-tasker, they baked about 5 minutes too long. They lost that bright white and got brown. Damn. That means no photos. Well, maybe a photo shopped photo, or perhaps black and white. This of course does mean there will be Macaroon Retry in the near future. But here's the thing about people like me. I'm a tiny bit Obsessive Compulsive. The more I looked at those pathetic brown meringues, the madder I got at me. So I did what any other crazy baker would do. I made them again. In my haste, I breeched a yolk and no peaks were to be had. So again. I now have over a dozen egg yolks in my fridge, and a beautiful batch (albeit a little short on the coconut) of Clouds in the oven. Which, I might add, I am tending to very closely. I turned my convection down to °310 and they baked for 12 minutes. And, finally, we have a winner. But here's the thing. They never seem to cook through, and they aren't tall like the picture in the book. I'm thinking no convection would be best. But as I am out of eggs. I am done for the day with this project! One day we will do meringues until we can solve the mystery. The photos are not stellar, the taste, however, is delicious! 3 large egg whites at room temp. Preheat oven to 325° and line baking sheets with parchment sprayed with baking spray. In a mixer, beat egg whites and cream of tartar. Beat until there is a dense foam, then add salt and gradually add sugar and beat to stiff peaks. Using a rubber spatula, gently fold in the coconut in 3 batches. Place rounded tablespoons of dough about an inch apart. Bake until golden about 19-22 minutes. Let them completely cool on the sheets about 30 minutes. Dip each cookie intot he Chocolate Glaze and and return to parchment. Chill until set about 10 minutes. Bring cream and butter to a boil in a small saucepan. Remove from heat and add chocolate and salt, just stirring to cover. Let it sit for a minute to melt and then whisk until smooth. Let it sit at room temp, stirring occasionally until it thickens, about 30 minutes (it didn't take long in my chilly January kitchen!). So, what are ya waiting for? Get in there and bake! Nothing like 4" of snow to paralyze a Southern city. No complaints. I have at least one day, perhaps 2 of no driving (I may have experience in this stuff, but my neighbors do not), so baking, cleaning, packing. On tap today is Crack Pie. This is from Momofuku's Bakery and Milk Bar in New York. At $44 a pie, I know this is no one hour baking challenge, but hey, it's a snow day! When I first read the recipe in the LA Times a year ago, I thought, big deal, it's a chess pie, a Southern staple. After reading on I saw that pastry chef Christina Tosi starts with a homemade oatmeal cookie crust. I like this idea a lot. So, Crack Pie it is. Here is the recipe, and then of course, the way I did it. 6. Refrigerate the cooled pies until well chilled. The pies are meant to be served cold, and the filling will be gooey. Dust with powdered sugar before serving. Okay, there is a lot going on here. I made the cookie first following the recipe but adding some vanilla extract. The batter was delicious...the baked cookie was a little tasteless. But then, you mix THAT with more sugar and more butter. YIKES! The recipe makes 2 pies, but I knew I didn't need to make 2 so I opted to halve the recipe and made the one in a 9" tart pan. The crust was easy to work with, and you have to be careful to get the crust up to the top so the filling doesn't ooze between the crust and the tin. Trust me, there is plenty of butter in the crust so there is no need to grease the tin. Now the filling. I do not have powdered milk on hand, so I skipped it. Maybe it would have made it a tiny bit thicker, absorbed a little butter, I don't know. The filling looks like butterscotch and smells heavenly while it bakes. We let it cool outside in the snow and cut in. People really pay $44 for a pie? It is SO thin, SO rich, Christina compared it to raw sugar cookie dough. The outside of the pie was tastier because there was a little contrast with the oatmeal cookie crust. But I am happy to report I am not into crack. The pie will head to the trash, kind of a waste, but I'll take a cookie any day. Now I still want to go to Momofuku, but I know what I am not having. Another snow day tomorrow (for me anyway) so perhaps we'll find something a little tastier to bake. Happy Snow! So it's over. Funny how the holidays are the main focus for so many weeks. We worry about the right tree, the right gift, serving the right food. And for me, the stroke of midnight comes along and the new years rings in and I am ready to purge the old. Clean the house, the fridge, the garage. After torrential rains on New Years Eve, I notice today on New Years Day that the daffodils have poked their little heads out of the ground. A sign that even outside the corner has been turned. Yes, I know, we are in the heart of winter. I am hoping for a snow day, some chilly temps, and I know it will still be dark when I get up. But I also know that it won't be long before the air is back on and I am digging in the dirt. Oh, wait, we had the air on last night. Windows open...crazy weather. My New Years Resolution is not in numbers. I always worry about diet and exercise, so no sense in getting all freaked out about it today. It just gets on my nerves how crowded the health club gets for a few weeks. I need to get some serious things done. Cabinets, closets, attic.....purge and downsize. It is insane how much crap we own. I hate that word, but it is so appropriate for my attic. WHY do I save this stuff. It is going to be an overwhelming project, but when it is done, the feeling of everything being in a plastic bin, no boxes, all labeled, stacked neatly. I get so excited just thinking about it! I will also hit the kitchen with new fervor....new recipes, new techniques, new foods. I have a sense of optimism, at least for now. So don't let your resolution get you down, there are 365 days in a year, make them count in some small way. Happy 2011. I will be back writing next week. I mean who can cook and bake when there are still lights twinkling about!